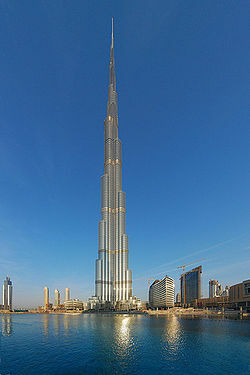 The world's tallest structure is the 828 m (2,717 ft) tall Burj Khalifa in Dubai, United Arab Emirates. The building gained the official title of "Tallest Building in the World" at its opening on 4 January 2010. It is taller than any other man-made structure ever built. Height to Architectural Top (including spires and pinnacles, but not antennas, masts or flagpoles). 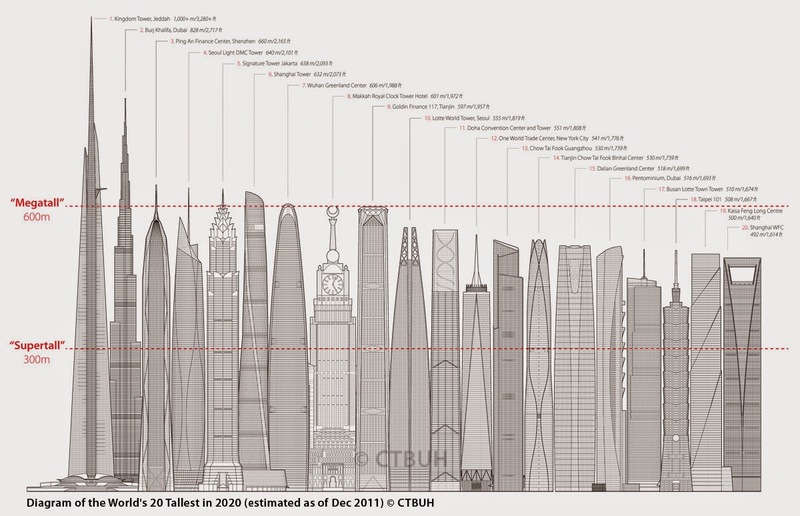 This measurement is the most widely utilized and is used to define the rankings of the 100 Tallest Buildings in the World. The height is measured from the level of the lowest, significant, open-air, pedestrian entrance. At the time, the Willis Tower held first place in the second and third categories, the Petronas Towers held the first category and the original World Trade Towers held the fourth. Within months, however, a new antenna mast was placed on the Willis Tower, giving it hold of the fourth category. On April 20, 2004, Taipei 101 in Taipei, Taiwan, was completed. Its completion gave it the world record for the first three categories. 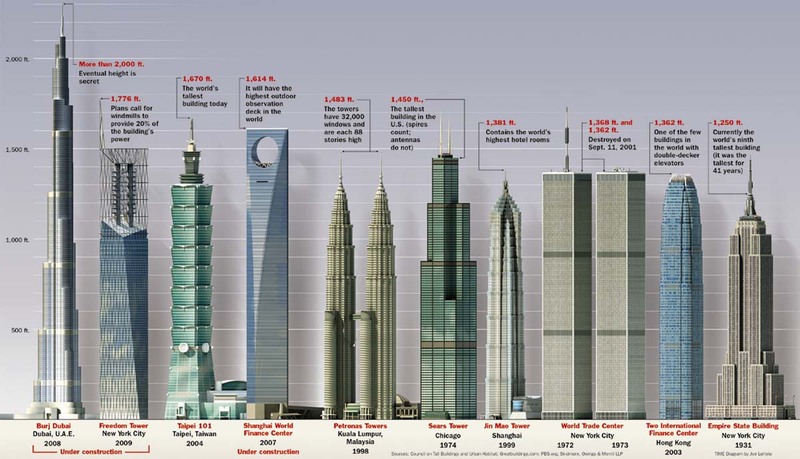 On July 21, 2007 it was announced that Burj Khalifa had surpassed Taipei 101 in height, reaching 512 m (1,680 ft). Since being completed in early 2010, Burj Khalifa leads in all categories (the first building to do so). With a spire height of 828 m (2,717 ft), Burj Khalifa surpassed Taipei 101 as the tallest building to architectural detail and the Willis Tower as the tallest building to tip. It also leads in the category of highest occupied floor. Before Burj Khalifa was completed, Willis Tower led in the fourth category with 527 m (1,729 ft), previously held by the World Trade Center until the extension of the Chicago tower's western broadcast antenna in 2000, over a year prior to the World Trade Center's destruction in 2001. Its antenna mast included, One World Trade Center measured 526 m (1,726 ft). The World Trade Center became the world's tallest buildings to be destroyed or demolished; indeed, its site entered the record books twice on September 11, 2001, in that category, replacing the Singer Building, which once stood a block from the WTC site.